Home30Blogs30DaysInfuriating Inconsistent Interfaces; F5 on the stand. Infuriating Inconsistent Interfaces; F5 on the stand. Ok, it’s another f5 post and if you’re not using f5 you might think this is irrelevant to you. However, I beg you to read on because the issue I’m describing today has a relationship to SDN and network automation, and why they are such a pain to do in so many cases. The day began simply enough: news had broken about the “Poodle” SSLv3 vulnerability, and like the majority of network and server nerds we needed to disable or block SSLv3 as quickly as possible in order to remove that particular attack vector. My job was to look at the f5 load balancers, and to do so I realized that I needed to understand what SSL we had out there, and I’d also need to determine the exact change I would be making. The profile now contains a ‘ciphers’ value, absence of which was being interpreted as “go get it from the parent profile”. 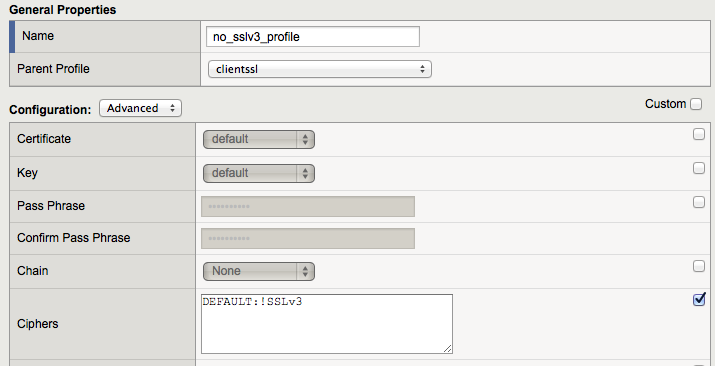 Changing the ciphers on the clientssl profile now implicitly changes the ciphers on no_sslv3_profile as well. The clientssl profile starts off with ciphers set to DEFAULT, and most profiles are configured to use clientssl as their parent. However, many of the profiles I looked at had a Custom cipher configured, and that cipher is “DEFAULT”. Correct; we have set the exact same ciphers on the profiles using a Custom setting rather than just allowing them to be inherited from the identical underlying parent profile. For these profiles, changing clientssl will make no different whatsoever, and they will continue to use DEFAULT ciphers. The plan was that rather than individually editing every profile to add “:!SSLv3” we would instead find all the profiles with a customer cipher set to DEFAULT and a parent profile of clientssl, and first unset the Custom profile. Then when we changed clientssl all the profiles would change at the same time. This would also make future changes much simpler, so it was a win-win. To change hundreds of profiles, using the web interface just isn’t appropriate, so I decided to generate the changes in the form of a script that I could then execute using the f5 CLI (well, tmsh). (tmos)# modify ltm profile client-ssl no_sslv3_profile ciphers ""
Well, that’s a step in the right direction; the ciphers are now set to “none”, but now I’m worried that this means that no ciphers will be allowed, in which case my Virtual Servers may not be taking traffic! Good news, my connections are still succeeding. Bad news, they are also succeeding using SSLv3, even though my custom ciphers say “none” and my parent profile says “DEFAULT:!SSLv3” now. Isn’t that just dandy? You cannot remove the custom setting using tmsh, but you can using the web interface. So do I go through and manually remove the custom checkbox from hundreds of profiles? Absolutely not. I will write the tmsh lines to modify all the existing cipher entries instead. How ridiculous though. Why would there be a function in the WebUI that isn’t in the CLI? That’s exactly the kind of problem I’ve faced before with (for example) Cisco NXOS XML RPC calls – commands in the CLI that have not been exposed via the NETCONF API. The same is true of A10 load balancers (though they promise that won’t happen again from version 4.0 onwards). How can we write tools to automate the network when we can’t do everything we need from the interface we choose to use? We will, I’m sure, never see a unified configuration language for network equipment because there are too many vendor-specific tweaks and features. However, it would be nice if we could consider standardizing on one management protocol at some point, so I’m not bouncing between JSON and XML constantly, if we could agree on at least a very basic “Here’s what I am” functionality (see my previous post on NETCONF), and let’s agree that a lack of functional equivalency between the various interfaces and APIs within a single product should be considered a P0 bug that needs to be fixed before release. I hate that updating APIs seems to be an optional extra task for many vendors, even today. 6 Comments on Infuriating Inconsistent Interfaces; F5 on the stand. All v11 BIGIP boxes. I can look up the specific code rev if that helps. Automation was just tmsh – a /bin/sh script with alternating lines of setting values then getting the values back to check that “!SSLv3” was now present so I could easily identify which lines, if any, failed to take. 1. You can still modify it. So in your case, what you really needed to do was ‘modify ltm profile client-ssl no_sslv3_profile ciphers “DEFAULT:!SSLv3″‘ and not ‘delete ltm profile client-ssl no_sslv3_profile ciphers’. There’s your missing automation step. Hi Nitin. The point of deleting the ciphers was to force the profile to inherit its settings from the parent profile (clientssl) rather than have to continue to manually update each profile individually next time there’s a change. I agree that I can modify, but that’s not equivalent to deleting the ciphers. Just so you are aware, F5 dropped syncronisation of the clientssl profile between cluster units in 11.2, I think it has since returned around 11.5 or maybe 11.6. Best to make your own custom client-ssl profile and use this to ensure it syncs correctly. FYI my own frustration today, 11.6 can create ECRSA private keys, awesome! 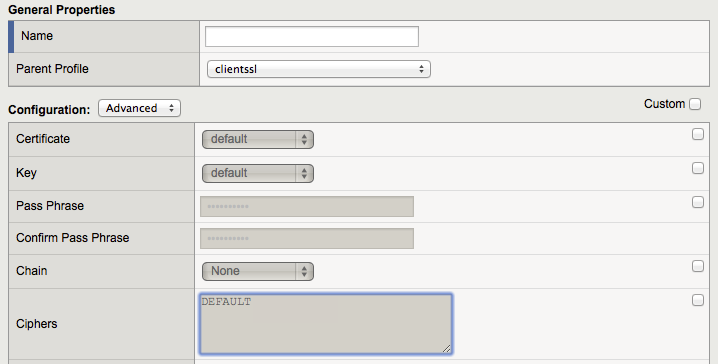 However you can’t use these in your client profile, gui gives an error saying it needs a key which it has. Not until you build the profile via TMSH does it complain it needs a RSA key.